This is truly a unique family enrichment program for parents and children to enjoy the process of art together. Each session we learn of a master artist and learn how they were able to master the art of creativity. At the end it's not about the artwork but rather the process to create and enjoy positive problem solving! 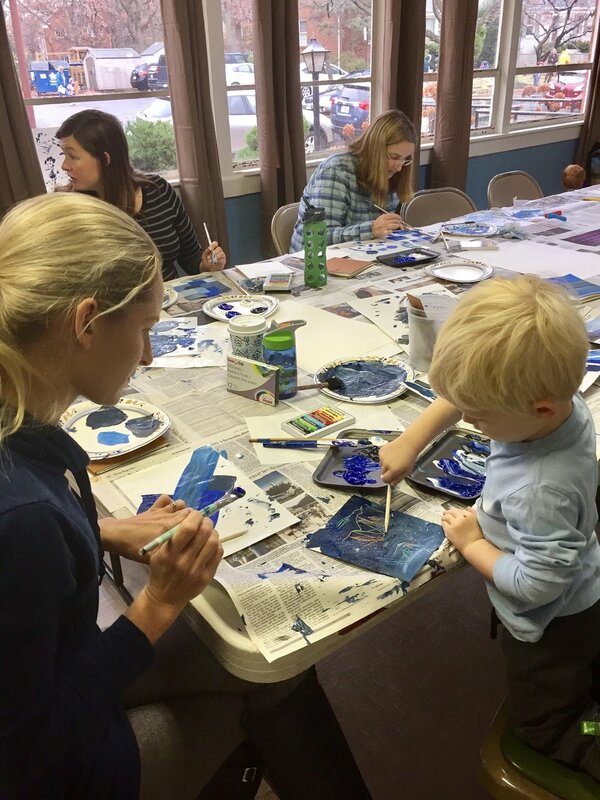 Parents/caregivers and their preschoolers are each given their own canvas and learn different art techniques using paint, pastels or watercolor's. Art stations are around the room for children to enjoy while mom or dad finishes their own artwork. At the end, everyone is celebrating their work. I am hitting the drawing board again and will be not be offering any playgroups until Spring 2018. We're not going anywhere just need to be a bit more "creative" with moms and babies for awhile. I am always willing to do a personal playgroup. Contact me if you have a group of at least 5 families that would like to create together! In the meantime join our newsletter and I'll keep you posted when our playgroups are back in session.